"I could not believe how such a few simple ingredients now make my morning so much more enjoyable! 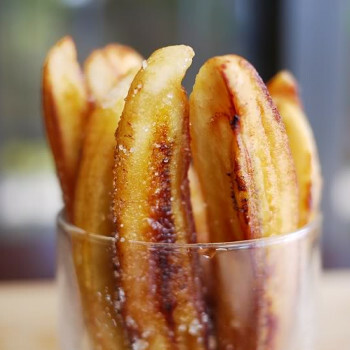 Tastes like banana..."
For best results deep fry the bananas in ghee. Otherwise, slice bananas and sautee them in ghee, tossing gently to avoid mushing the banana. Garnish with spices. Optionally try cardamom - an Ayurvedic favorite. How Can Banana with Ghee & Cinnamon Make You Feel Great? When you're hungry and in need of a quick snack, simply heat up some ghee, toss in some bananas, and watch them sizzle. A dash of spices, cinnamon and ginger, make these morsels quite delicious! This rich, nourishing snack couldn't be easier to make or more satisfying from tummy to soul. Enjoy as a quick snack, or a light breakfast, or as a healthy dessert. Bananas in sizzling ghee are heavy, hearty and ojas-building. They are ideal for autumn, when your body needs sweet, fatty foods to prepare for winter. As fall approaches, warm sweaters, richer foods, and cozy evenings offer comfort from the cooler temperatures and anxiety of a busy fall schedule. The pastiness of banana (gooey quality on Joyful Belly) coats and soothes your gut, helping you to relax. Sugar and fats 'sweeten' your digestive tract, bringing comfort and ease. Cinnamon and ginger warm the gut, relaxing muscles that may be tense from the hustle and bustle. Spices help your body assimilate a fall diet rich in sweets and fats while keeping the lungs clear of Kapha mucus. Feeling persistently hungry but need to take it easy on snacks? Bananas are a healthy way to keep your stomach satisfied for a few hours because they contain complex carbohydrates. This snack is a healthy way to honor and indulge your sweet cravings. The natural sweetness of the bananas and the fats in ghee also make this dish a perfect midday pick-me-up in lieu of harder-to-digest snacks that destroy your appetite and disrupt your digestive routine. You may need easy, nourishing options when your digestion is impaired from too much indulgence. Bananas with ginger, cardamom, and cinnamon is a simple recovery meal to give your digestion a rest. Is Banana with Ghee & Cinnamon Good for Me? Find out by taking this free, easy quiz. You'll learn your body type, and whether Banana with Ghee & Cinnamon is a good fit for you. Time to complete: approximately 1 minute. Do you like 'banana with ghee & cinnamon'? Why or why not? What makes it unique? Is there something you'd like to know about 'banana with ghee & cinnamon'? Because it's approaching fall in Colorado, my bananas were unripe and I cooked them along with the other ingredients. It was a great breakfast and especially helpful during menstration. I could not believe how such a few simple ingredients now make my morning so much more enjoyable! Tastes like banana pancakes! The bananas all went to mush. I think larissa is right to use unripe ones, because the ripe ones just didn't stay solid. Maybe I'll just by plantains instead, which are in every grocery store and corner market. It really is like making maduros, just with different spices. I also had to be carefull not to sautee them for too long, because they developed a candy-like coating. It was good, though!